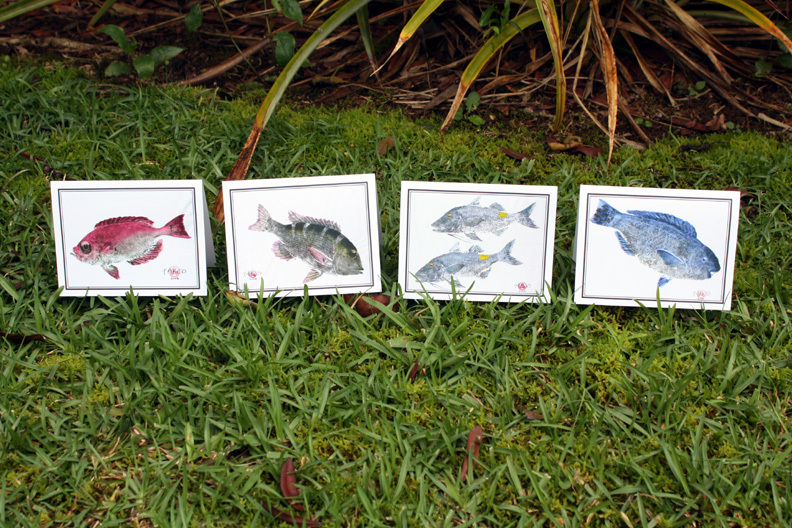 Original Gyotaku fish prints from Hawaii. Framed art, mounted art, or print your catch. Takeo offers printing services of your catch. Fresh fish is preferred, however, prints can also be made of fish that has been frozen. 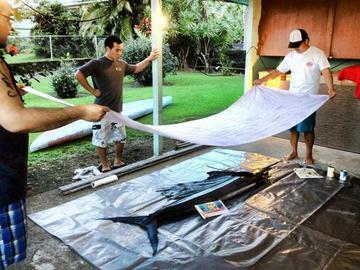 It's important to keep the fish in the best condition possible, paying close attention to the fins and scales. Fresh fish should be kept cold, in a cooler or refrigerator so that once the printing is complete, the fish can still be consumed. Prices for printing your catch will vary, depending on the size of the fish. 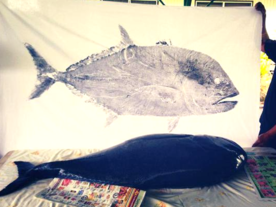 Fish prints will be mounted and matted using acid free material for preservation of the art piece. Larger pieces will require mounting by a local frame shop. Framing of prints is an additional option, making Takeo Gyotaku a "one stop shop". Mounted pieces are available in various sizes. Currently, all prints sold by Takeo Gyotaku areoriginal art pieces not giclee or lithographs. Prints are added to this page as they become available. I do a lot of local gyotaku for fishermen who keep me extremely busy but I often have prints available that may not yet be posted here. Please email me at Lkageyama@yahoo.com for current availability or any questions you may have. You can also find me on Facebook and on Instagram. Don't forget to check out ourgyotaku t-shirts. *Shipping and handling will be calculated upon checkout for US locations. All sales are subject to prior sale. I accept Paypal. Please email for multiple item orders and combined shipping discounts. For sales on the island of Hawaii, pick up can be arranged. Takeo welcomes any questions on items for sale or services provided by Takeo Gyotaku. Mahalo Nui Loa! Unique greeting cards featuring Takeo's gyotaku artwork. These 4 1/4"x5 1/2" cards are printed on heavy cardstock for a quality feel and look. Use them for any occasion.